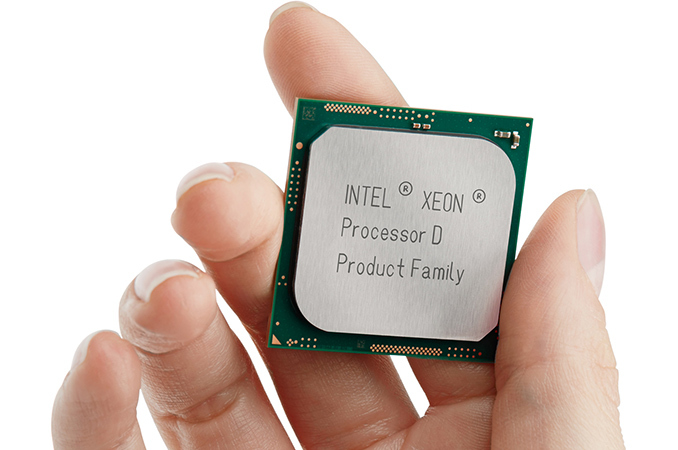 News about the next update on Intel’s Xeon-D line has been thin. For over a year now, we were expecting to hear what plans were in store for one of the more esoteric Intel SoC lines: the first generation parts were based on Broadwell, had up to sixteen cores, and supported both ECC memory up to 128GB and 10GBase-T on a single bit of silicon for under 45W. When it came out, it was amazing all this was on a single chip, compared to the quad-core parts in the consumer market. Xeon D ended up having a lot of uses for networking, storage, management, and dense server installations. How and when Intel would be updating this product line has been somewhat of a mystery. Based on a few slide presentations from Intel however, we had been expecting something new to come in 2018, with Intel expecting to use Skylake-SP cores (ones with AVX512 support). Having poked and prodded Intel, we were expecting to be involved in any media communications about the platform, but it seems like the managers behind Intel’s Price List have jumped the gun a bit. Intel’s price list is used by its customers (OEMs, system integrators) to identify the tray cost of its processors. Intel defines a tray as 1000 units with an OEM-style warranty, and the price is per unit. Historically this document has been updated weekly, however due to leaks (not unlike this one) in 2017, Intel has moved to a monthly update cycle. We had been expecting a mid-January refresh of the document, but that did not happen until the very last day of January, and we get these three processors listed. The top of the stack is the Xeon D-2191, an 18-core processor with hyperthreading, running at a 1.60 GHz base frequency for a TDP of 86W. Without any extra information about the SoC itself, such as memory support or added features/controllers, it is hard to say if this is any better than what the previous generation offered: the Xeon D-1571 for example, is a 16-core part with hyperthreading and only 300 MHz less on the base frequency, for almost half the TDP. It could be construed that this value will include the AVX512 units in action, however TDP is usually quoted as the base frequency without AVX instructions in flight. Also given in the list is the Xeon D-2161I. That’s a capital I on the end of that SKU name, which is a new addition to Intel’s product suffixes. It adds in additional problems, speaking as an individual whose name starts with the letter I, because I often get packages from China addressed to ‘Lan’. A capital i and a lower case L, in a font without serifs, is not without its problems. Unless this price list is using a lower case L. Looking at who writes the list, apparently distinguishing between Ghz and GHz isn't a priority either. But this SKU is a 12-core part, at higher frequency at 2.20 GHz, but 90W total. We can compare this to the D-1531, a 6-core part at 2.20 GHz, but 45W TDP: so the newer hardware is double the cores and double the TDP – again without knowing what else is in the silicon, this seems like a specific scaling and not so much of an efficiency increase. It would be interesting to see the die-size comparison. The last SKU is the D-2141I, coming in at eight cores with hyperthreading, 2.20 GHz base frequency at 65W. This is likely a harvested part to keep die yields high. Out of the price list, nothing tells us that these are Skylake-D parts. What does tells us this is an update to Supermicro’s product list. Recently SM has announced two new motherboards in its motherboard matrix grid, called the X11SDV-8C-TLN2G and X11SDV-4C-TLN2F. These are mini-ITX motherboards with Skylake-D SoCs already integrated, and come with support for 512GB of LRDIMMs, DDR4-2666, and dual 10GBase-T networking. These motherboards do not specifically state which CPUs are installed. Xeon D-2183IT 16 / ? ? ? ? ? Xeon D-2166NT 12 / ? ? ? ? ? Xeon D-2146NT 8 / ? ? ? ? ? The 'N' part is usually reserved for networking focused processors. We are in the process of speaking to Intel about the official Xeon D launch. I wonder if/when Xeon D's with integrated graphics will arrive. Intel purportedly had a few on their road map to a few niche scenarios (generally involving video encoding) but I haven't heard anything in a long while about them. I think part of the TDP increase may be due to full Lewisburg chipset integration. For the iGPU, it almost sounds like you are referring to the early Purley leaks. It stated "Cannonlake graphics and media transcode". "Cannonlake seems to be having problems, and some sources say its due to the iGPU. There is a Cannonlake part coming without iGPU so the speculations seem valid. It would then, mess up plans to have Cannonlake graphics for server." is there proof of this - Intel is likely working on something make the new processors significant different - keep in mind with both AMD and Qualcomm/Microsoft on them - Intel will not be stupid and release a product that is not significant. I also suspect Intel with Raju on board is going to have a significant GPU change in future. It has nothing to do with them being stupid. People screw up, despite best intentions, and for Intel that's Cannonlake. I'm not sure what your connection to GPU and battery life is. If you think you'll see 24 hour gaming life on laptops, forget it! It'll never happen. Gaming is one of the most intensive load for systems. I don't believe Windows on Qualcomm ( it not all ARM ) will have 20 hour batter life - that really does not matter much - who actually will used the laptop for 20 hours - one does have to sleep. It not about battery life - it about iGPU holding up 10nm - I don't believe that is realistic statement - I think it more that they are working to make sure 10nm lives up to performance especially that AMD play around the we got more cores things. A true 8 core laptop would be cool - especially if fan less. Since Cannon Lake is at least 18 months late, there certainly is a problem here. However, that could simply be with the 10 nm process which Intel has to used for anything of significant volume.